Making felted art objects and eco printed garments and paper prints are the two passions of Saint Paul, MN based artist Jean Manrique. Eco printing is the process of transferring the pigment from real leaves and blossoms onto fiber or paper and so is a seasonal practice. Once there’s a hard freeze here in Minnesota and the leaves are gone, Manrique’s felting season begins. She has loved working with fine wools ever since she went with her mother to the Amana Woolen Mills in Amana, Iowa to choose special fabric to make her first suit. She saw her mother knitting as a child but didn’t learn to knit herself until she was an exchange student for a year in Switzerland. Manrique thought it seemed as though all the Swiss girls and women knew how to knit and says her host mother thought she should learn as well. Manrique agreed and has been knitting ever since, almost exclusively with wool. 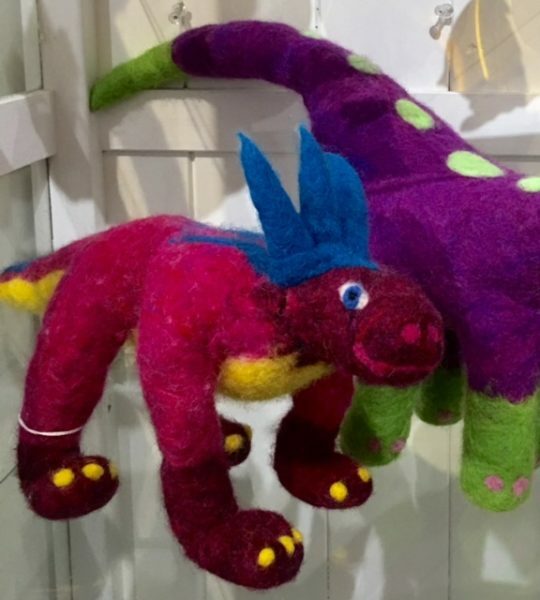 What Manrique loves about making felted wool art is the versatility and beauty of what can be created. She enjoys how the beautiful colors of merino roving and the natural colors of undyed wool fibers feel when they turn silky under her hands when warm water and olive oil soap is added. Manrique claims there is great satisfaction in seeing the soft, wet fibers begin to felt together and become one unified piece of sturdy wool fabric that are then molded into lovely objects. With felt as a medium, Manrique says the possibilities are endless.